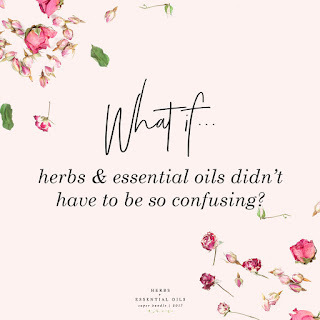 Ever feel that herbal knowledge is difficult to come by (at least from sources you can trust) or are you a tad bit confused by essential oils with all the hype you find online? I've been both of these at one time or another in my herbal journey. I fell in love with herbs in my early twenties, which was before the days of Google (I'll be 50 on my next birthday, just in case you are curious!) and herbal knowledge was not so easy to come by. I hunted for herb shops within a days drive and had many adventures searching out my newfound passion. I read every book I could find, which wasn't very many, and continue to add to my collection of herb books when I find a new title of interest. While I wouldn't trade those days for anything, I am so very thankful for the internet and easy access to information, herbal education, books, and ordering herbs online. My beginning with essential oils was interesting. Again, before Google, I found an ad in the phone book for a business that sold 'herbs and essential oils'. To the kind lady's credit, she did have a few bottles of essential oil on a shelf in her 'office', but from what I saw, she was clearly in another business. When I asked which essential oils she recommended, her reply was spot on, whether she was just trying to get rid of me or not! "Use what you like." Sounds crazy, and I was a little annoyed, mostly for wasting my time and gas getting there; but I've discovered that the essential oils I 'like' are quite helpful to me, so maybe she really was offering her best advice. For everyday use, I like (LOVE) geranium, lemon, peppermint, lavender, and tea tree essential oils. Essential oils are very powerful, concentrated, and do require common sense and caution when using. It is best to have a good essential oils guidebook on hand and follow safe practices. My protocol is know your oil, and then dilute, dilute, dilute! All of this for only $29.97! It is available only until May 22nd, so if you are interested, click HERE to learn more. I love herbs and essential oils and am so excited to add these great ebooks to my library!